NETWORK FINALS: There were 0.1 bumps for NBC’s COLLEGE FOOTBALL game and CBS’s NCIS rerun in final numbers. CABLE HIGHLIGHTS: ESPN’s COLLEGE FOOTBALL day was dominated by the Auburn vs. Georgia game at 1.24, with the day’s other games at 0.65/0.54/0.35, and ESPN2’s game at 0.23. A&E’s LIVE PD rose 0.11 to 0.63. Hallmark’s movie IT’S CHRISTMAS EVE was at 0.63. 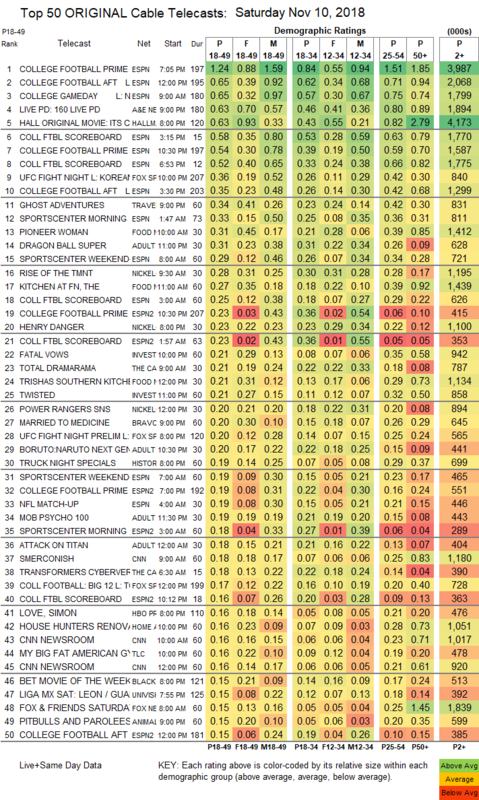 Fox Sports 1’s UFC FIGHT NIGHT was at 0.36. Travel Channel’s GHOST ADVENTURES slipped 0.02 to 0.34. On Food Network, PIONEER WOMAN jumped 0.08 to 0.31, KITCHEN AT FN ticked up to 0.27, and TRISHA’S SOUTHERN KITCHEN was at 0.21. Adult Swim’s line-up performed as follows: DRAGON BALL at 0.31 and 0.18/515K compared to last week’s 0.24/0.11, MY HERO ACADEMIA up 0.08 to 0.20/502K, NARUTO up 0.07 to 0.21, BORUTO up 0.05 to 0.20, MOB PSYCHO 100 up 0.05 to 0.19/443K, ATTACK ON TITAN up 0.05 to 0,18, JOJO’S BIZARRE ADVENTURE up 0.02 to 0.15, BLACK CLOVER steady at 0.13/309K, HUNTER X HUNTER down 0.04 to 0.11/272K, FLCL down 0.04 to 0.11, POP TEAM EPIC at 0.11/245K, LUPIN THE 3RD at 0.10/215K, and SAMURAI JACK at 0.09/206K. On Nickelodeon, the morning RISE OF THE TMNT climbed 0.06 to 0.28, and the afternoon HENRY DANGER was up 0.03 to 0.23. ID’s FATAL VOWS ticked down to 0.21. Bravo’s MARRIED TO MEDICINE was at 0.20. History’s TRUCK NIGHT specials were at 0.19. TLC’s MY BIG FAT AMERICAN GYPSY WEDDING ticked down to 0.16.